Flexible and brushable, white mortar ideal for long lasting waterproofing. Consists of high quality cement, selected quartz aggregates, and acrylic elastomeric resins. The product is ready for use just with the addition of water. It has excellent durability to solar radiation, frost, standing water and it is water vapour permeable. Presents exceptional adhesion and covers hairline and capillary cracks. 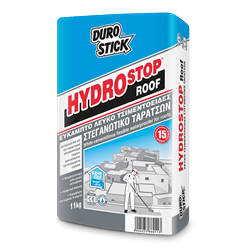 Ideal for waterproofing roofs, balconies, swimming pools and water storage tanks. Suitable for the perimeter waterproofing of basements, preventing rising damp created from bouncing rain. Classified as product for surface protection of concrete surfaces (c) per EN1504-2.